PowerShell is an administrative tool that Microsoft provides to simplify system administration. It helps automate a wide range of tasks, such as Active Directory administration, user and permissions management, and reporting on security configurations. Learning Windows PowerShell is much easier if you have basic guidance. To help you get started using PowerShell to manage your Windows infrastructure, we created this free study guide (.pdf). 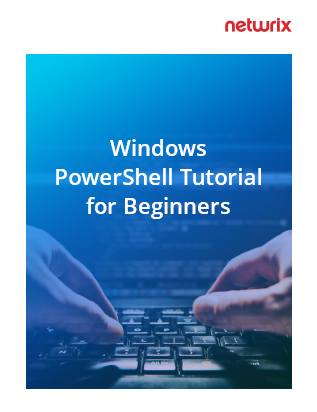 This PowerShell tutorial pdf opens with an introduction to PowerShell scripting basics. It guides you through various topics, starting with launching PowerShell and preparing to run PowerShell scripts. Learning these basics will help you easily perform virtually any administration task in your Windows IT environment. In addition, this Windows PowerShell user guide in pdf explains how you can schedule your PowerShell scripts and commands, so you can use them in a set-and-forget mode.